A surround sound system is best if you want to recreate the whole theatrical experience at home, but stringing the wires for the surround speakers can be a real pain in the buttocks. Likewise, if you want to enjoy your tunes in a noisy environment such as on a plane, there's no substitute for a good pair of noise cancelling headphones. Two decidedly different tasks requiring very different solutions, but I've found a couple of good products that can help. It may seem an unlikely source, but JBL, for decades the famed initials behind a magnificent pedigree of loudspeakers, has come up with a nifty little device that lets you get around the problem of running wires all around your home theater. Their WEM-1 ($359) can also let you put speakers wherever you want outside of the home theater, as long as you remember the range of the device. JBL has earned its reputation. The company made its name in movie theaters and recording studios, and now makes fine home audio speakers including the ES series I reviewed last year and now use regularly as reference speakers in one of my home theater setups. But just because you make good speakers doesn't mean you know a whit about getting the sound from the amplifier to the speakers. Not only that, but making a wireless adapter that's up to audio snuff can be more difficult than it sounds. A few dedicated surround systems feature wireless rear speakers, but this is a rare breed generally. Likewise, I remember trying a pair of standalone wireless surround speakers years ago that used infrared to transit the sound, and which weren't worth the price of admission. Later, I tried some RF speakers that worked all right, but which were suitable only for use on the patio, the garage, or wherever else you wanted the convenience of speakers but weren't worried about audiophile quality. It can be tough. You have to eliminate interference from other radio devices, for one thing and in today's modern, electronics-laden home that can be easier said than done. JBL's WEM-1 gets around the audiophile aspect of the challenge by basically ignoring the speakers. While I'm sure they'd be very happy if you used the WEM-1 with JBL speakers only, the little system will work with whatever speakers you throw at it. You could even use this system to set up the center back channels if you want to expand your 5.1 system to full 7.1. Remember, though, that the success will depend on how well the extra two speakers – and the JBL amp – work with the rest of your system. I tried it with the rear speakers of the JBL ES system, one of the more logical uses for such a concept, as well as using it to run a set of Paradigm speakers I had set up in my bedroom and, later, my family room for the purposes of the test. The WEM-1 system comes with a transmitter module you connect to your audio source. In my tests, I wired it into a good Rotel preamplifier, feeding the WEM-1 from its "front left and right" outputs when using remote speakers and from the "surround left and right" when using it with the 5.1 system. You can also hook it directly into the preamp's output jacks. The receiver/amplifier unit connects to the speakers, wherever they may be. It includes a subwoofer output as well, which can come in handy if you're using a satellite/sub system. There's a switch on the unit's rear for changing ID addresses. Wireless or not, this system does require wires, one pair from the preamp (or a pair of patch cords, if you're using the preamp outputs) and one that goes to the speakers (and maybe another single one to the subwoofer). The wirelessness comes from the space between the modules, which JBL says can be up to 70 feet apart. You also get a remote control you can use to adjust the speakers' volume, change inputs, or mute. Sound quality was just fine. Naturally, it's limited by whatever speakers you're using, but during my tests I never heard any interference, just good audio. JBL uses a radio frequency of 2.4 gigahertz and it appears to work well. I'm not sure why JBL chose 2.4 gig instead of a higher rating or possibly Wi-Fi, but around my home the system worked as advertised. The receiver/amplifier section comes with a built in 50-watt-per-channel amplifier to power the speakers and JBL claims a frequency response of 20Hz – 20kHz plus or minus three decibels. You can choose from five equalization curves via a controller on the rear of the unit. JBL says they're "tailored for use with select JBL loudspeakers" but there's also an unequalized bypass setting. 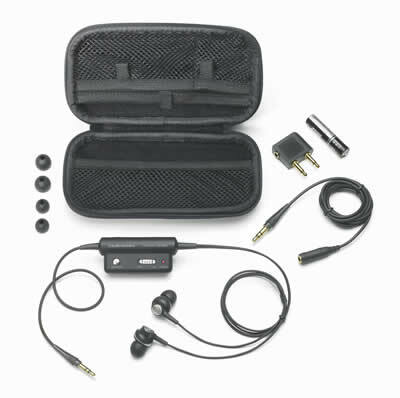 Audio Technica's little ATH-ANC3 QuietPoint Active Noise-Cancelling in-ear headphones ($150) are a nice choice for travelers, joggers or people who just want to shut out part of the world around them. I've only tried the full, over ear type of noise cancelling phones before, so was interested in seeing how the "bud" type would work. And they work well! The buds themselves ram into your ears nicely and I had no trouble keeping them there. The ATH-ANC3 offer very good sound quality and the noise reduction technology works fine. Audio Technica says they block out up to 85% of environmental noise, the background stuff that can be so annoying. You can fire up the noise reduction via its switch when listening to music, of course or, as with other such units I've tried, it can be activated on its own to help create a more peaceful environment. I tried the noise cancelling on its own in a local watering hole and it did a good job. Ditto for when I was "passenging" in a friend's car, at which time a lot of the road noise went away. Strangely, when I activate the noise cancelling I can no longer hear my wife! My favorite application for such phones is when flying; these buds and the other phones I've tried eliminate a lot of the engine noise and other extraneous crap and make listening to the audio output from my favorite airline's seatback TV's much, much more enjoyable. Now if only they could come up with some decent programming…. But you can't blame Audio Technica for that! The ATH-ANC3 comes in a nice little package that fits nicely into a purse, pocket or travel bag and includes three sizes of eartips for a customized fit. The obvious advantage to bud-type noise cancelling phones like these is that they're a lot smaller and easier to pack. They may let in a little more noise than the over the ear types, but on the whole, I liked how these Audio Technicas did the job.